Conflict resolution, conflict management and conflict transformations are major themes in this unique book which examines, explores and analyses the mediation attempts of the Organization for Security and Cooperation in Europe in the Nagorno-Karabakh conflict. Ohannes Geukjian shows the most striking characteristic of a protracted internal conflict such as this is its asymmetry and explains that, without meeting basic human needs like identity, recognition, security and participation, resolving any protracted social conflict is very difficult. The Armenian Azerbaijani case demonstrates how official diplomacy may not be able to solve protracted internal conflicts as, without addressing the real causes of the problematic relationship, attempts at peace making will always be sporadic and the space for mutual understanding and compromise shrink. Geukjian shows that conflict transformation has a particular salience in asymmetric conflicts such as this where the goal is to transform unjust relationships and where a high degree of polarisation between the disputants has taken root. 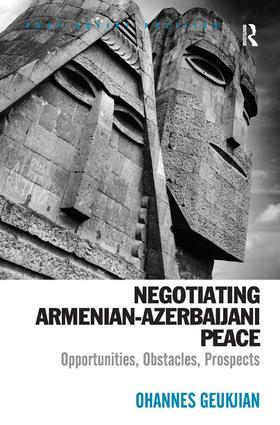 Using the Nagorno-Karabakh case, this book focuses on the anatomy and causes of deadlock in negotiations and highlights the many difficulties in achieving a breakthrough. Ohannes Geukjian is a Lecturer in the Political Science and Public Administration Department at the American University of Beirut.